The Massive Murray Paddle (MMP) is a classic paddle that has been running since 1969, with a variety of craft paddling 404km over 5 days from Yarrawonga to Swan Hill and is one of the longest flat-water races in the world. With a focus on community, the Massive Murray Paddle brings together paddlers from a wide range of experience and paddle craft - from racing kayaks, canoes, outriggers, surf skis, sea kayaks and also novelty craft. There are serious competitors and people who are there for the experience and atmosphere (we are more of the latter!). 2017 event maps will be available here when they have been released. We are available to assist with preparation for you and your team - training, gear, advice and kayak hire. We will be running an information / training session with a Legend of the Murray, Bill Robinson. We offer paddling training to any individuals or teams by Private Tuition - contact us on info@eastcoastkayaking.com or 03 9597 0549 to organise a suitable date. We have a Mirage 532, Mirage 580 / 582 kayaks and Epic V7, V8, V8 Pro and V10 Sport surf skis available to hire for the event. Contact us if you need to hire a kayak for the event. Whether you are using a surf ski, a Mirage or some other paddle craft, there are tips and tricks, as well as essential equipment, you should look at to make your marathon paddle as comfortable, safe and efficient as possible. View the video to see some of our modifications. For more gear and handy kayak modifications see our Gear for Marathon Paddling page. We had a blast these last 3 years! Read our Blog for an account of our 2014 experience. 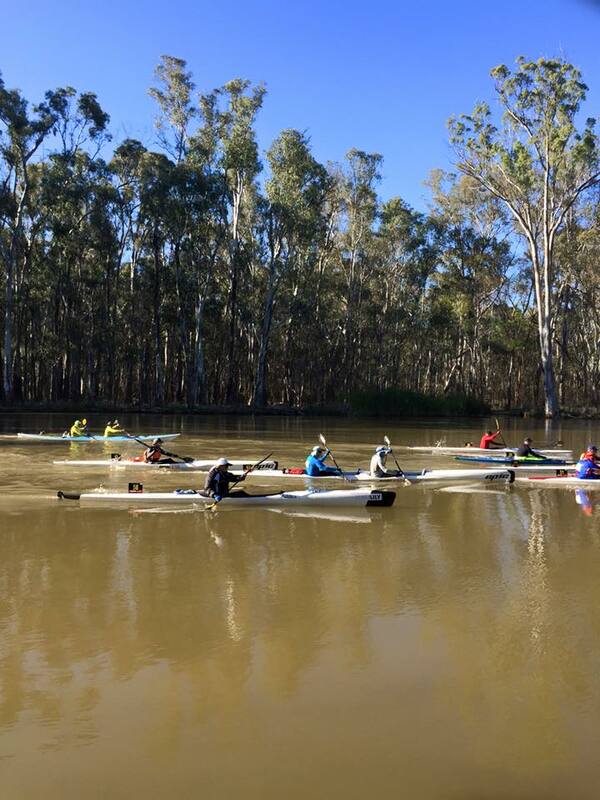 East Coast Kayaking is again entering a team in the Massive Murray Paddle (Murray Marathon). This year we will enter two kayaks in the relay - at least 8 paddlers, up to 12 (6 per Mirage 730 kayak - 2 or 3 pairs, swapping over at each stage). Use the link to the Massive Murray Paddle registration page that we will send you to register and pay as a member of our team. Details for your entry below. Pay for your Team Accommodation, Food and Hire package and order a shirt (and a cap) - returning team-members are welcome to purchase additional shirts if they wish but it is the same as last year. Shirts will be presented in September. Details of inclusions and exclusions below. Shirts - Team East Coast Kayaking Long Sleeve Polo Sun Smart shirt - cost $45. We may also have a team cap available this year - stay tuned! Fundraising - it is a requirement of entry that each person nominates a charity - though this can be a school, community group or sporting club. Feel free to nominate your own cause and manage your own fundraising. Our charity of choice is Sale to Sea Disability Kayak Challenge. We will have a Everyday Hero page available for tax deductible donations that go directly to this charity. To facilitate team logistics we have put together a pre-paid package to cover 5 night’s accommodation, food (see below inclusions) and kayak hire. Cost is $315 . This package is available to purchase online at our Kayak Tours and Events page and should be purchased before the event. What we provide: Double kayaks (Mirage 730)and safety gear. We recommend you bring your own breakfast of choice to get you going for your big days. We are providing one big breakfast fry-up at Picnic Point on Day 3. Hydration system - we can advise on making your water bladder into a hands free drinking system so you don’t have to stop paddling to drink and don’t become dehydrated through not taking the time to drink! BYO drinks. We all like a beer after a big day’s paddle! Transport (to, from & during the event) - we will help with organising car-pooling to minimise the number of vehicles required. Make your own arrangements re. fuel costs. Team shirt ($45). We are also planning on offering a cap this year as well. We have some limited space to accommodate non-paddlers coming along to assist and support team members. To be part of the Support Team, contact us first, then purchase accommodation/food package, checking the Non-paddler/Own kayak option. For individual paddlers (not in the relay) you should bring a support person to assist you be self-sufficient on the water and getting to and from the start/finish line. Other Paddling Options: Single kayak individual or relay - get a group together & either use your kayak or hire one of ours (Mirage 532 / 580 / 582). You can enter the Massive Murray Paddle as an individual and paddle the whole thing but relays are easier, friendly and in a double very do-able! If you haven’t done the MMP before we recommend a relay! Contact us to discuss this option at info@eastcoastkayaking.com or 03 9597 0549. To be part of our team but paddling your own kayak, contact us to discuss, then check the Food only or Food & Camping option when purchasing your MMP Team Expenses package.